Some people have asked me why I don’t allow comments on this blog. I had initially thought about enabling them but in the end I decided against it. The truth is, most websites that run on WordPress require people behind them to continually monitor and block misbehaving users, most of which end up being spambots. Things like CAPTCHAs, Bayesian classifiers and Machine Learning filters solve part of the problem but (bad) things still get through the cracks. There’s also the increased attack surface. WordPress is not even remotely bug-free and the less unwanted data I let in, the less the chance of finding out one day that my website has been used to host malware or is part of a botnet. 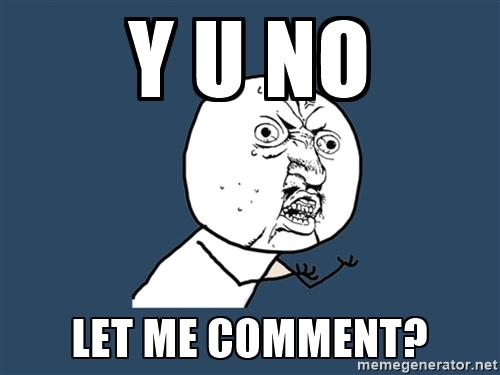 The last reason why I don’t want comments here is that comment boxes are restrictive anyway. Nowadays anyone can open free accounts on sites like Medium and write beautiful responses full of cat memes, so there’s no need for me to spend hours installing, configuring and maintaining all the infrastructure that would allow you to express yourself here. So… if you want to send me a comment, note, criticism, encouragement or a cat meme (you know who you are), send an email to nlofeudo [at] gmail [dot] com, tweet me at @NahuelLofeudo or open an account on medium.com and write there. I promise I’ll read everything you send my way.